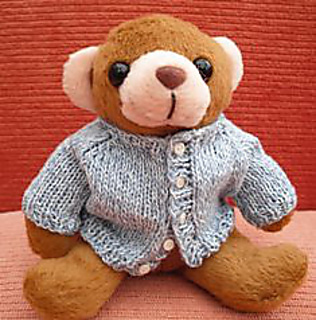 I have designed this easy to knit pattern to fit a tiny teddy bear. The outfit is shown on a teddy of about 12cm (4½ inches) tall when standing, with a chest size of about 11cm (4 inches). As the knitting can be stretched quite easily, the measurements are flexible and the cardigan will fit teddies smaller or larger than this.